When the holidays come around, we all start thinking about cookies! Cookie swaps, trays, and even parties all centered around holiday themed cookies. I love making the cookies of my youth, cookies I have been eating and making since I was little with my mother. One of our favorite customs was to recreate our favorite Italian American bakery classics at home. 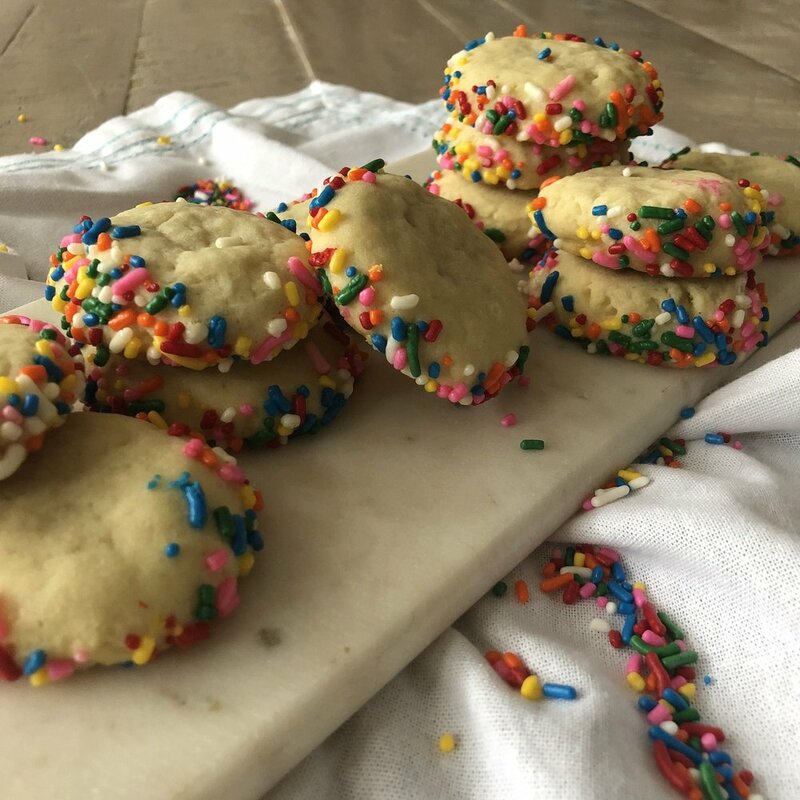 We conquered lace cookies, tri-colors and our favorite sugar cookie, the Italian Sprinkle Cookie. Every bakery has a version and most are heavily doused in sprinkles. We elevated them by adding some olive oil and lemon zest and only sprinkling the outside. So, you taste the lemon but still get some sprinkles in very bite! You probably have most of the ingredients already sitting in your pantry so ready, set, bake!! Combine butter, egg, both sugars, lemon zest, vanilla extract and olive oil in the bowl of a stand mixer. Using the paddle attachment, cream until fully combined. In a separate bowl, whisk the flour, baking soda and salt. Gradually add the flour mixture to the other ingredients in the stand mixer. Mixing until just combine. Wrap the (very soft) dough onto a large piece of plastic wrap and allow to chill in the fridge for one hour. Using a tablespoon, form small balls of the dough and then press to create a circular shape with thick sides. Roll the cookie sides into the sprinkles to create a border. Place the cookies on the baking sheet, about one inch apart. Bake for 10 minutes, until the bottoms are golden brown.